Haringey Council is currently consulting on a number of proposals for the Hornsey Park area, on Hornsey Park Road between Clarendon Road and Avenue Road. You can see detail of this consultation on the website of the Parkside Malvern Residents Association. We fully support PMRA’s ambition for a quieter Hornsey Park Road that is less dominated by motor traffic. The London Cycle Design Standards specifically warn against lanes of this width and instead offers the following guidance: ‘If the proportion of HGV and public service vehicle traffic is less than 10 per cent then, subject to the carriageway geometry and speed and volume of traffic, motor traffic lane widths may generally be reduced to between 2.5 and 2.9 metres.’ Reducing the road width from 3.2m to 2.5-2.9m would also enhance the desired speed reduction and ‘gateway’ effect. 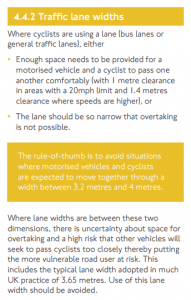 We are strongly opposed to the proposed 3.2m width as this is likely to leave room for doubt about whether sufficient room is available for overtaking, increasing the possibility that following vehicles will attempt to pass far too closely. There are roads very near to Hornsey Park Road that feel hostile to cycling due to close passes and dangerous tailgating, exacerbated by the road widths present alongside traffic islands. We are anxious that this situation is not replicated on Hornsey Park Road.